This FM 2014 player profile of Sadio Mane shows a real explosive force for the left wing and he’s only £3.9 million, a great bench warmer at least. Sure his crossing leaves some to be desired but you can work on that area, but his explosive speed, flair and ability with the ball at his feet leave many a defender for dead. If you need someone as backup for a top club to play anywhere on the left of midfielder as a winger or inside forward I certainly would recommend this guy. Screenshots are from Pedro again who saw great success with this kid in Portugal. Sadio Mane Age: 21 Position: AML/ML Role: inside forward / winger / advanced playmaker Club: FC Red Bull Salzburg Nationality: Senegalese Value: £2 million Price tag: £3.9 million (in patch 14.3) CA: 136 / PA: 158 Sadio Mane profile in 2013 (after starting new game, patch 14.3) Sadio Mane profile aged 24 in the year 2016 Sadio Mane career history until 2016 This FM 2014 player profile of Sadio Mane shows a real explosive force for the left wing and he's only £3.9 million, a great bench warmer at least. Sure his crossing leaves some to be desired but you can work on that area, but his explosive speed, flair and ability with the ball at his feet leave many a defender for dead. If you need someone as backup for a top club to play anywhere on the left of midfielder as a winger or inside forward I certainly would recommend this guy. Screenshots are from Pedro again who saw great success with this kid in Portugal. I he scored more goals he’d be exceptional. As it is he is he a very good player. And if you’ve got the money to splash there’s no reason why you shouldn’t go for him. His speed and dribbling makes him good. Is he better than Bruma? He’s better value for money if you judge on the starting asking prices I’d say and take into consideration future return and wages…but I don’t see him as better than Bruma on the hole. Yeah, we’ve already profiled him and seen similar so I’d agree. 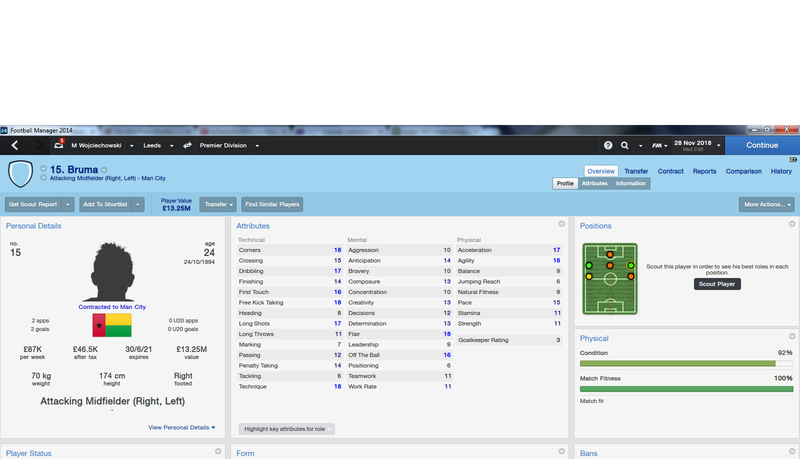 His crossing honestly hasn’t been a problem for me in the first and second season he got a few assitsts. The problem is he got a very bad injury at the end of the second season so i think he can become even better than that with the right guidance. and like you say for less than 4 million if you have the money to spend and need a winger you can’t go wrong. Keep up the awesome work on the scouting network guys! Unfortunately on my save he has not been that good. He lacks quality when it comes to final third of the pitch, his crossing is abysmal and has a terrible shot in him on top of that he is very selfish player. He would be good first team player for team in second half of the table or ones fighting relegation. That is a shame mate, I guess he could vary from team to team and depending on your tactic maybe.